20 years ago it was easy to start a business. Buy a product, add your profit margin, open the doors to your store and there you go. In the modern business world you have to do so many things just to be up to standard. Have a website, Facebook page, Instagram, Linkedin, Youtube channel, newsletters, networking events, website tracking, Twitter handles and and and… It is not as easy as it used to be, when you do all of these things as a business owner you are still doing what every other business owner is doing, these are not differentiators. WHAT DOES THIS MEAN FOR THE MODERN ENTREPRENEUR? Information and task overload, burn-out and many, many failed businesses. 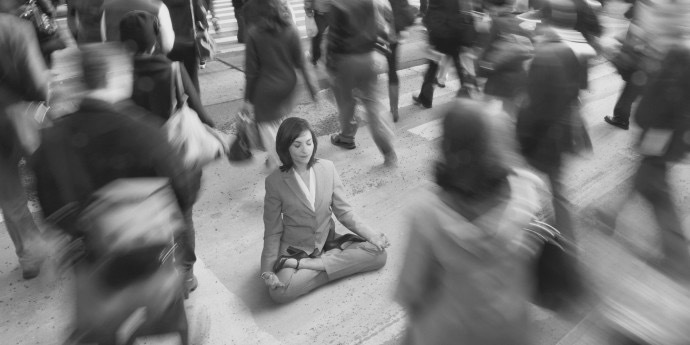 One way to combat the stress of being a business owner in the modern world is meditation. Mindfulness meditation has scientifically proven positive effects when it comes to calming the mind, handling stress as well as increasing compassion and gratitude in the work place. “Toxic emotions disrupt the workplace, and mindfulness increases your awareness of these destructive patterns, helping you recognize them before they run rampant” as stated by Forbes magazine. Take 20 minutes in the morning and facilitate a mindfulness meditation session with your team, do this for 30 days and share your results with the New Normal team, are you up to the challenge..? OUR TIP FOR YOU: Here is an awesome instructional video for a simple and powerful meditation practice by Vishen Lakhiani. Thank you for this. I listened to it last night, then downloaded the app. Simply yet powerful and effective!